Cousins Subs has been in the middle of a significant remodeling and rebranding effort. Three new multi-unit deals just inked in Wisconsin and Illinois will help facilitate more growth for the brand. The Wisconsin-based sub brand has been strengthening its unit-level economics and creating a stronger core of franchise partners. Last May, the company announced a rebranding initiative committing to streamline the look and fee of its locations --a strategy that positioned the brand for its next phase of growth. 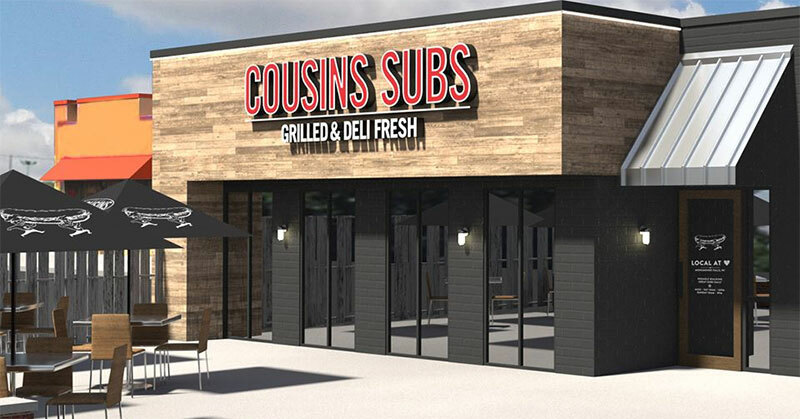 "With our remodeling and rebranding initiative underway, now is the right time to revive the brand through Midwest growth, specifically in the Chicagoland area," said Christine Specht, president and CEO at Cousins Subs. "We've increased our same store sales and average unit volumes positioning us for multi-unit franchise investment." Brothers, Amit and Kalpesh Patel of Chicago, Illinois and Munster, Indiana, entered the Cousins' system just last month. As owners of OM Group, a multi-brand business established in 2006, the Patels have 22 years of industry and management experience. They oversee more than 1,500 employees across 50 quick service restaurants and approximately 40 gasoline/convenience store locations throughout the Midwest. The Patels will develop the Chicagoland market through a multi-unit investment of 10 stores over four years. "After Cousins revamped its image and menu, we felt it was the perfect time to take the brand to different markets and what better market than Chicagoland," said Amit Patel. "Though we will look for other acquisition opportunities anywhere in Wisconsin, our goal is to be a main franchise group of Cousins in the Chicagoland market. We are excited to see the reaction on people's faces when they receive a fantastic product with great service." Chad Ellett and Randy Fusch from Reedsburg, Wisconsin, along with Mike Gilbertson of South Beloit, Illinois, also joined the Cousins brand in March. Collectively, they have 35 years of restaurant industry experience and since 2003, Ellett and Fusch owned and operated two co-branded quick service restaurant concepts in Reedsburg and Stoughton, Wisconsin. As they found success with their existing restaurant businesses, they looked for additional opportunities within Wisconsin and purchased two Cousins' corporate locations in the Madison market. They have signed a development agreement to open two new stores over the next two years between Madison and Rockford, Illinois. "We're looking for a company to grow with and bring to the forefront as a major chain in our market, and Cousins fit into our growth plans," said Ellett. "Cousins is taking initiative through its new restaurant design, while respecting its franchise community. The new design is feasible for the franchisee, which tells me they really care for their brand partners and that's what makes the whole brand grow as a whole." Father-son business owners, John Stewart Sr. and John Stewart Jr., purchased both Cousins' franchise locations in Sheboygan, Wisconsin as well as a third in Mequon, Wisconsin in 2016. Stewart Jr. oversees operations at all three locations and brings more than 19 years of restaurant experience from his family's business, Food Services Incorporated, which was started by his father twenty-four years ago and sold in 2016. Their business operated restaurant concepts, including franchised, in more than 30 college universities and ten corporate food service locations across four states. "We looked for many other franchise opportunities, but appreciated Cousins' business model, product, and its family, locally-owned identity, which was much like the identity of our company," said Steward Jr.
"The new multi-unit franchise groups provide a strong foundation for growth not only in our current markets, but in new markets as well," said Specht. "We plan to grow contiguously in markets near our home state of Wisconsin and believe we will experience the most success by growing in these areas first." Cousins is seeking additional multi-unit franchise owners throughout Wisconsin, Chicagoland, and the Midwest.